Make the pickled cucumber by adding the vinegar and salt to 100g water in a container. Finely chop the mint and thinly slice the cucumber using a mandolin and add both to the pickling liquid. Cover and set aside. 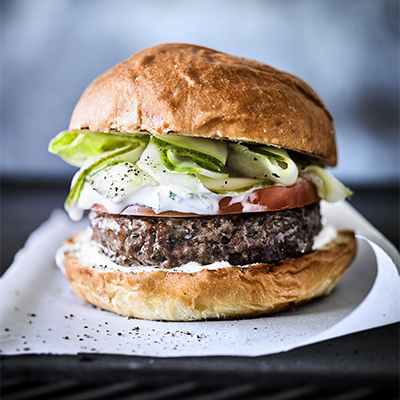 Make the burger sauce by finely chopping the mint and adding to the crème fraiche. Season with the lemon and salt. Cover and set aside. For the burger patties, toast the caraway seeds in a hot, dry pan until fragrant, set aside to cool. Finely chop the anchovies and add to a bowl along with the lamb mince, toasted caraway seeds, salt and pepper. Divide into 150g balls and shape into burger patties. Set aside. To cook the burgers, use the Furnace BBQ with the chargrill plate, and cook the burgers by flipping every 15 to 20 seconds until the core temperature reaches 60°C. Remove from the heat and allow to rest on a cooling rack placed over a tray. In the meantime, toast the buns. To finish the burgers, spread some of the burger sauce on the bottom half of the bun and place the burger patty on top, followed by a slice of tomato and pickled cucumber. Finish with the lettuce and place the top bun on.